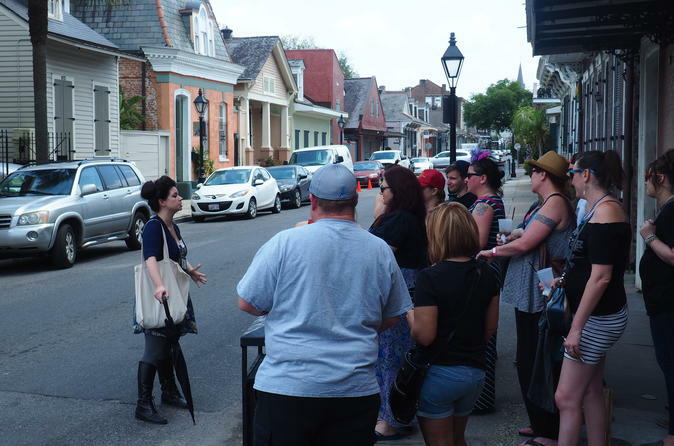 This is a tour that takes you through the sweat soaked madness of New Orleans best and worst. Get lost with your guide in this strange city and explore its dark past because this is not your grandmother's tour. This tour is for adults 17 years and older and the content not appropriate for children or easily offended. New Orleans is a hot, humid and sometimes unforgiving place where, in the dead of summer, the air takes on the quality of a crawfish boil. It is a long and drawn out fever that seeps into the bloodstream and compels even the sweetest from small town America to do obscene things. This is the real New Orleans which does not fit neatly into the category of "American" city. It is a black water port, Caribbean and lawless; settled by thieves, prostitutes, and the other criminally disposed. It is also Catholic and pious with Roman altars trimmed in gold. It is equally black magic, Voodoo, and the steady throb of African drums. New Orleans is sin and confession. It is violation and forgiveness. This is the place where God and the Devil shook hands so the party could go on. New Orleans is a city for the sinner and the saint. This is a tour that takes you through the sweat soaked madness of our best and worst. Get lost with your guide in this strange city and explore its dark past.